Did you know that woman can get cleavage creases? Cleavage creases are caused by the upper breast shifting over the lower breast, creating pressure on the skin. As the skin ages and becomes less elastic, the creases become permanent. It affects women of all ages, shapes and sizes. We probably have all seen cleavage creases before on other women, but just did not realize what it was. If you are anything like me, then you probably want to avoid having cleavage creases. Bravity is an amazing, new revolutionary bra that can help you avoid this problem. Created for women by woman, Bravity, is a new revolutionary bra that is comfortable enough to sleep in and it prevents wrinkles that form in the middle of a woman’s cleavage. Bravity is an anti-wrinkle, no-cup bra that comfortably separates and supports the breasts while you sleep, stopping the formation of creases and wrinkles in the cleavage area. Bravity has Y-shaped padded straps that go in between the breasts leaving them exposed to allow the natural lymphatic cleaning process to occur. Made of nylon and spandex so it’s soft and cool to the touch. Each strap has a hook and eye on the upper front of the shoulders to adjust the straps. You can choose from black or tan. Bravity retails for $34 at: https://www.bravity.com and on Amazon. To best determine the correct size to order, use a measuring tape underneath your breasts to find the band size – no cup size needed. (Size chart: XS – 28 in; S – 32 in; M – 36 in; L – 40 in; XL – 44 in). Creases have more to do with the type of skin than breast size; a little fat on the cleavage can be a great thing to have! 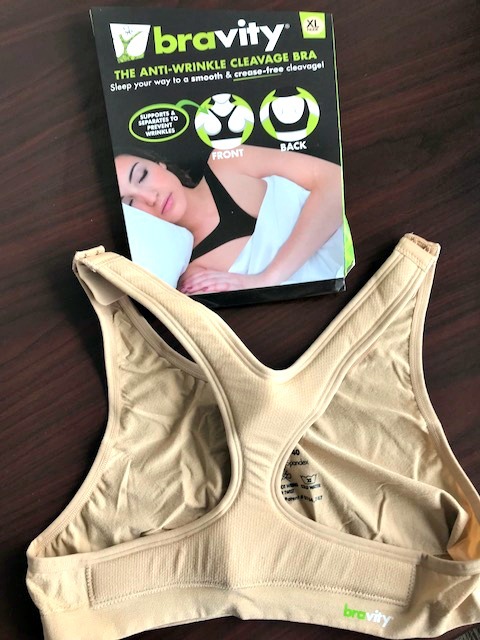 Our sleeping bra to prevent wrinkles provides excellent support for the breasts, preventing the overstretching of the skin caused by the swelling. When Bravity is used in combination with a sports bra; it keeps the breasts separated during your workout, ensuring your cleavage looks as great as the rest of you.